A picture of Iskra (The Spark), no. 93, 17 March 1905. (The name refers to the Russian saying, "from the spark will come the flame," which came from a letter of one of the Decembrist exiles to Aleksandr Pushkin.) This was the newspaper published by the Russian Social-Democratic Party, i.e., the Russian Marxist party. 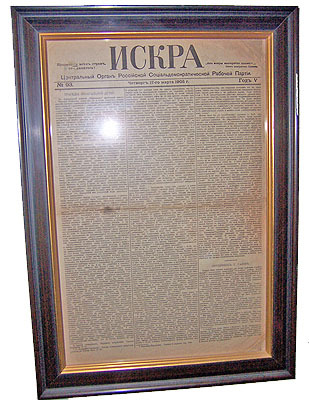 It was control over the editorial board of this newspaper that was one of the reasons leading to the split of the Russian Marxists into Menshevik and Bolshevik factions in 1903. I have this copy, framed and hanging on my wall; that's why you see the flash reflected on the glass of the frame. Read the textbook chapter 35. Check the remarks by Professor Blois and Professor Evans on Marxism in Russia. In 1963 Professor Samuel Baron published his definitive biography of Georgii Plekhanov, one of the key founders of the Marxist movement in Russia. Read some of Baron's reflections on long, and continuing, study of Plekhanov in *.doc or *.pdf format. Lenin's Speech: What Is Soviet Power? / Ленин:Что такое Советская власть? For 50 points maximum extra credit, submit the Lenin paper assignment based on Lenin's, What is to be Done? (1902). For a maximum of 25 points extra credit, read excerpts from Lenin's “Our Programme” (1899) and explain the basic ideas of Lenin’s plan for a social-democratic uprising? For 50 points maximum extra credit, read R. N. Carew-Hunt, The Theory and Practice of Communism: An Introduction (1957) and write a one-page paper explaining the main tenets of "Russian" communism. For 50 points maximum extra credit, read Fedor Dan, The Origins of Bolshevism (1946) and write a one-page paper in which you answer the question, "What were the origins of Bolshevism?" For 50 points maximum extra credit, read Trotskii, My Life (1930) and write a one-page paper in which you explain why Trotskii became a revolutionary. For 50 points maximum extra credit, read Philip Pomper, Lenin, Trotsky and Stalin (1990) and write a one-page paper comparing the lives of these three revolutionaries. For 25 points maximum extra credit, watch Stachka (Strike) and write a long paragraph in which you explain some of the ideology behind the movie. For 25 points maximum extra credit, read Trotsky's remarks on the use of terror in his 1920 pamphlet, Dictatorship vs. Democracy (Terrorism and Communism), and explain his justifications for the use of terror in a long paragraph.